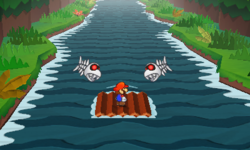 Jungle Rapids is the second level of World 5 in Paper Mario: Sticker Star. It is a misty river with Fish Bone-infested waters. The Traveling Toad is also here. The level starts on a short jungle platform with a boathouse that leads to the raft. Jumping on the raft will make it start moving. Right off the bat, it goes over a short waterfall that leads to a stretch with Spear Guys throwing spears and barrels at the raft in attempt to break off a log from it. If all logs break off, Mario falls in the water and gets a Game Over. Near the end of the stretch, a chain of Spear Guys will drop a gigantic barrel into the water that can cause an instant Game Over. If avoided, the raft will go over another waterfall into the last stretch. The last stretch has many Fish Bones that will attempt to chip away at the logs of the raft. They can be knocked away with the Hammer. Towards the end, the Rubber Ducky thing appears along with more Fish Bones. Finally, the raft crashes into a dock, dropping Mario off right at the Comet Piece, surrounded by dancing Spear Guys. Going left will lead to a small opening in the wall that leads to a pipe. The pipe takes Mario to the ground on the side of the river that eventually leads to the Traveling Toad being bullied by some Spear Guys. Upon defeating the Spear Guys, the Traveling Toad simply leaves, claiming he is going back to Decalburg. The Secret Door is located to the right of the boathouse. It contains the Mini Vacuum. This page was last edited on June 4, 2018, at 04:22.